Want to learn more about Riviera River Cruises? 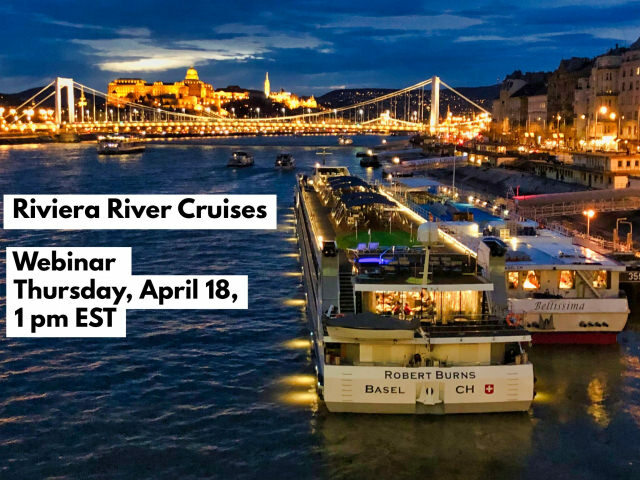 This coming Thursday, April 18, I’ll be joined by Marilyn Conroy, Vice President of Sales & Marketing North America for Riviera River Cruises, to discuss Riviera’s transparent pricing and friendly solo cruiser rates. Our presentation is appropriate for both consumers and cruise sellers, and there will be plenty of time for questions and answers. The webinar commences on Thursday, April 18 at 1 p.m. Eastern. All you need is your computer and optional, but recommended, headphones if you are in a noisy setting. Register by clicking this link. Can’t make it? Register anyway. You’ll get access to watch the webinar replay on demand at your own convenience. Haven’t heard of Riviera? I hadn’t either until last year when I was invited to attend the christening ceremonies of its then newest ships, the m/s Robert Burns. Check out my story, Seven Ways That Riviera Seeks To Stand Out. To register for Thursday’s webinar, simply click here.